This piece was originally written for and published in The Carrier in November 2013. I’ve been thinking recently about leadership. It’s a complex concept, isn’t it? We talk about the need for it…a lot. We need strong leadership within the work-place, within the sporting arena, within minority groups, within political movements. Half the time though, I have no way of connecting with what people actually mean by it. It’s an opaque term, an amorphous role and possibly a slightly demotivating proposition. For me, one of the central problems is the inherent assumption that the individual – the great leader – holds the key. Which seems unlikely to me. After all, individuals don’t operate in isolation. There are undeniably people who have an astonishing mix of charisma, charm, confidence, empathy, talent and intelligence. They are inspiring and humbling in equal measure. But they exist within a web, they operate within networks of people who, collectively, drive their thinking and hold their hands at critical moments. We’re none of us part of a formally constituted body set up to deliver Sync. Or anything else for that matter. We either work as freelancers or we run our own micro-companies. And yet, we hold together to create something that I think is exceptional: it’s changing the landscape in Scotland and is simultaneously providing ways for the wider sector to recognise and embrace that change. It’s providing both a guiding light and an anchor for people. It’s doing everything that the so-called ‘great leader’ should do. However, ‘it’ isn’t a tangible thing. We – the people doing the thinking, the creating and the delivering – we are something. We’re not any one of us particularly recognisable as leaders within our fields. Together though? That’s a different story. I like to think this is an example of distributed leadership. As a model, it probably doesn’t fit brilliantly into the definitions of distributed leadership emerging from various business schools. But as a concept it makes a lot of sense to me. It’s our collective mind that’s making the difference, creating the space for genuinely progressive thinking to occur. By ourselves none of us could get near conceptualising some of the stuff we’re doing. When we push our agenda in collaboration with one another, we start to break through into virgin territory. I’m not very interested in the cult of the individual. We’re all embedded in numerous contexts or societies or communities, influencing and being influenced all the time. When we consciously use this web of interactivity to build intelligence, we begin to see the emergence of real patterns of rooted leadership with a strong sense of ownership and responsibility. 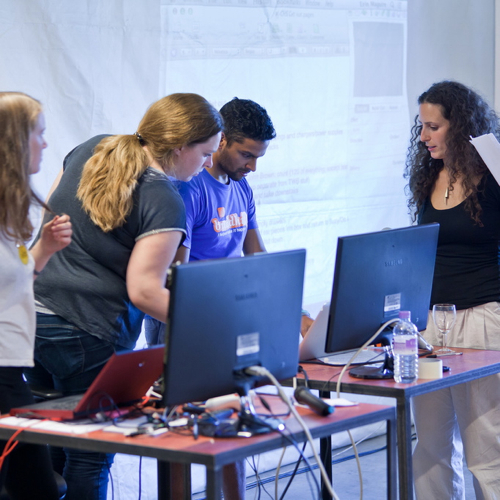 The photo is of the Sync team at Culture Hack 2013. It was taken by Chris Scott.